Scrambled eggs should be one of the easiest things to get right but alas, they are all too often ruined by a lack of care and attention. There are few things I turn my nose up at but I will absolutely refuse to eat a plate of rubbery, dried up scrambled eggs. Just writing about them makes me shudder. Ignore the amount of butter and cream in the recipe and concentrate on the finished dish-the best eggs you will eat. Above all, take your time cooking the eggs-heat is not your friend here. I’ve added a side order of roasted asparagus because they’restill in season and because eggs and asparagus are perfect partners. Heat the oven to 200˚c, fan oven 190˚c, mark 6. Toss the asparagus in the truffle oil and season with truffle salt (or normal salt) and some ground black pepper. Roast in the oven for about 15-20 minutes, depending on the thickness of the spears. 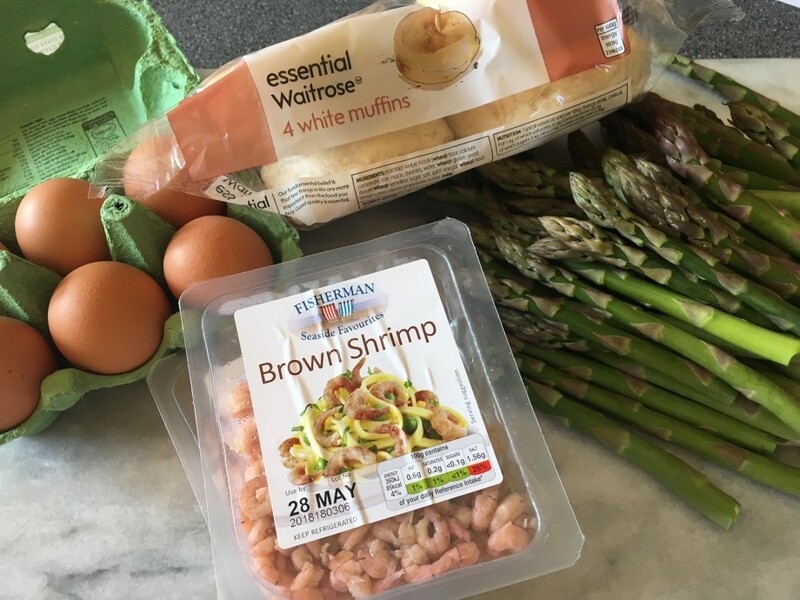 About 5 minutes before the asparagus are ready, start to prepare the scrambled eggs. Melt the butter over a very low heat. Meanwhile, in a mixing bowl beat the eggs with the cream and milk and season with salt and ground black pepper. Pour the eggs into the melted butter and leave for about 30 seconds. Stir the eggs gently and leave for a further 30 seconds. Stir and continue like this until the eggs are the consistency of lumpy custard. Toast the muffins until golden brown. 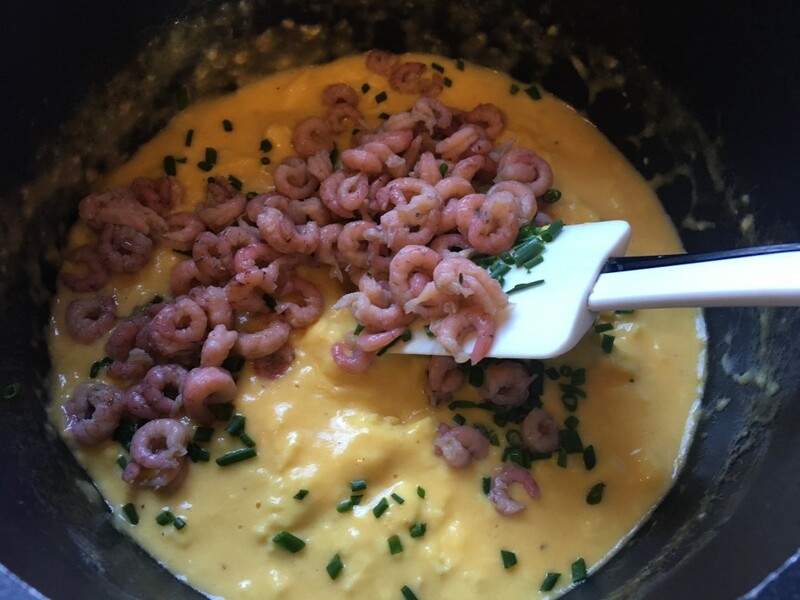 Stir the brown shrimps and chives into the eggs and cook for a further 30 seconds or a little more if the eggs are still really runny. 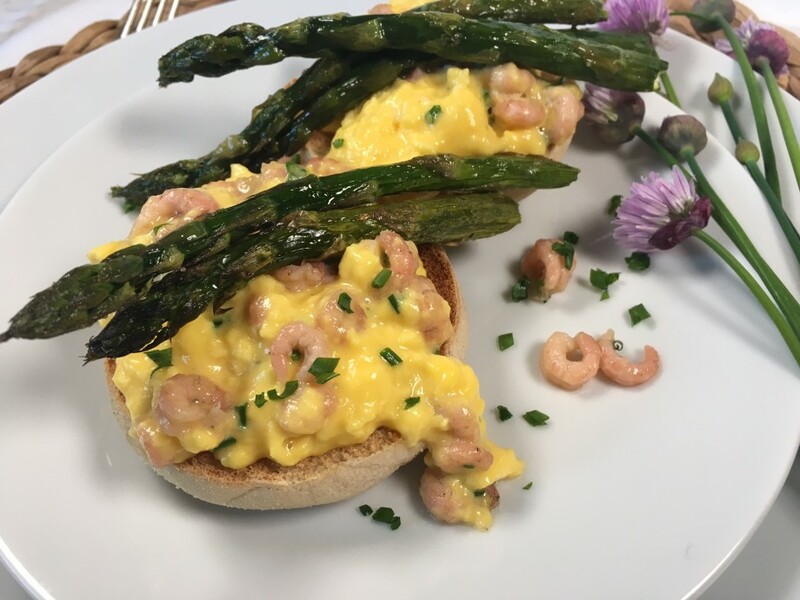 To serve, pile the scrambled eggs over the muffin halves and place a few asparagus spears on the plate.